Roisin Boyd is an award-winning journalist currently teaches journalism and political communications in the Dublin Institute of Technology (DIT), Aungier Street. She has worked as a journalist and current affairs producer with RTE – with a focus on social justice/human rights & international stories; as a communications advocate with various NGOs including the Irish Refugee Council where she was Head of Communications. Her work has included the coverage of stories in Northern Ireland, Cambodia, Vietnam, Somalia and the DRC. With FOMACS – Forum on Migration and Communications she mentored and produced a radio documentary series with migrant women: ‘Having your Voice Heard’, broadcast on The Curious Ear RTE Radio 1 ( 2009-2010). She is a doctoral student at the Centre for Transcultural Research and Media Practice (CTMP) Dublin Institute of Technology; Research Topic, ‘Revelation and Concealment. The Validation of Refugee and Asylum Seeking Narratives’; Analysing the discursive construction of refugee stories in the print and broadcast media; interrogating Irish journalistic and advocacy practices, including her own. Peter Feeney became Ireland’s Press Ombudsman on 01 September 2014, after serving as an independent member of the Press Council of Ireland since October 2013. As RTÉ’s Head of Broadcast Compliance and Freedom of Information Officer he managed for over ten years RTÉ’s processes in dealing with complaints to the Broadcasting Authority of Ireland. He was also responsible for the production of guidelines and training in programme standards. Prior to Compliance and FOI he was from 1990 to 1997 Editor of Current Affairs Television in RTÉ. Before joining RTÉ he lectured in politics in the University of Ulster. Michael Foyle is a member of the NUJ’s Ethics Council, representing the Republic of Ireland. Michael was a journalist on The Irish Times for many years and later a lecturer in Journalism at the DIT, where he is now Professor Emeritus. Michael has been involved in media development, especially the development of journalism education, and ethical codes, in Eastern, South Eastern Europe, the Caucasus, Central Europe, Africa and more recently the Middle East, working for the BBC, the IFJ, UNESCO and UNICEF. Michael frequently comment on issues relating to the media in the media and other areas. Aidan White is the Director and Chief Executive Officer of the Ethical Journalism Network. He worked as a journalist with newspapers in the United Kingdom, including the Birmingham Evening Mail, the Financial Times and The Guardian, before taking up his post as General Secretary of the International Federation of Journalists from 1987-2011 based in Brussels.He founded the EJN in 2012. He has written extensively on human rights, ethics and journalism issues and played a leading role in establishing the International News Safety Institute, the global campaign for news safety, as well as the creation of IFEX, the International Freedom of Expression Exchange, a global network of free expression campaigners. In 2014 Aidan served on the appointments panel of IMPRESS, the Leveson-compliant alternative press regulator in the UK. Chinedu Onyejelem is the Editor and Publisher of Ireland’s multicultural bimonthly Metro Eireann. He is the author of News in Black and White which has just been published. After moving to Ireland in 1997, he worked freelance for a number of publications including The Irish Times, Garda Review, The Irish Catholic, and Medicine Weekly. In January 2000, Chinedu joined the Irish Times website www.ireland.com as a trainee where he worked until mid-2002. Following his departure, he has concentrated on developing Metro Eireann. Chinedu is presently a Director of Concern Worldwide, and a member of Irish Department of Foreign Affairs /NGO Standing Committee, which advises the Irish Government on Human Rights issues overseas. Rares Mihai Nicula. Social Inclusion Co-ordinator at New Communities Partnership, the only migrant led umbrella organisations for migrant led community groups. Originally from Romania, he has been living in Ireland since 2007. While studying for a PhD in Sociology, he started volunteering first with Romanian Community of Ireland, then Fingal Ethnic Network and New Communities Partnership. Since 2015 he has been working as a Social Inclusion Coordinator, position in which he coordinates the work of NCP in working with groups and service users, facilitating their integration journey in their new home. Professor Roja Fazaeli, Lecturer in Islamic Civilisation(s) at the Department of Near and Middle Eastern Studies Trinity College Dublin. Roja has published widely on Islamic feminisms, female religious authorities, women’s rights in Iran and human rights and religion. She has also contributed to the Irish Times and the Irish Examiner. Her book “Islamic Feminisms: Rights and Interpretations Across Generations in Iran” was published by Routledge in November 2016. Previously Roja worked for Amnesty International, Irish Section and a number of other Non-Governmental Organisations. She has served on the executive boards of Irish Refugee Council, UN Women Ireland, the Association for the Study of Persianate Societies and Amnesty International Irish Section. Roja is currently on the editorial board of the Journal Religions and Human Rights and serves the Scholars at Risk representative in Trinity College Dublin. She also serves on the board of directors of the Immigrant Council of IrelandHer Ph.D. thesis was a comparative study of Islamic law and international human rights law concerning women in the Shi’a tradition and was funded by the Irish Research Council for Humanities and Social Sciences. She has published numerous papers and book chapters on the topics of Islam and gender, Islamic feminism and human rights. Currently she is working on completing a monograph on a conceptualization of Islamic feminism and human rights activism in Iran. Scott Griffen is Director of Press Freedom Programmes at the International Press Institute (IPI) in Vienna, Austria. He joined IPI in 2012 as press freedom adviser, focusing on Latin America and the Caribbean. As director of press freedom programmes, he helps plan and oversee IPI’s long-term project work and helps guide the organisation’s overall strategy in defence of press freedom and freedom of expression worldwide. He holds a bachelor’s degree in humanities from Yale University and a master’s degree in global ethics from King’s College London. Jenny Hauser, senior journalist at Storyful. Storyful is at the forefront of creating an ethical system of usage around eyewitness media by ensuring copyright is respected and through the real-time verification of content that is being shared. Anne Walsh, NYCI’s Intercultural and Equality Programme Manager: Anne has a Master degree in Anthropology and has been working for the National Youth Council of Ireland (NYCI) since 2008. Her role at NYCI is to support youth groups and organisations to embed interculturalism, equality and inclusiveness in their ongoing work. Anne does this through training, resource development, research, consultation and by developing strategic relationships at national level. She also works in an advocacy and policy role representing the needs of young people from minority groups. Anne coordinates an Equality and Inclusion Support Network with key staff from National organisations to work strategically to embed inclusive practice in the sector. 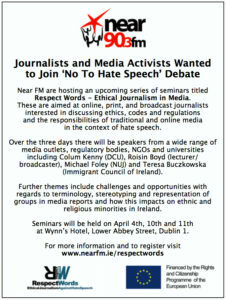 Anne coordinates the No Hate Speech Movement in Ireland for NYCI. 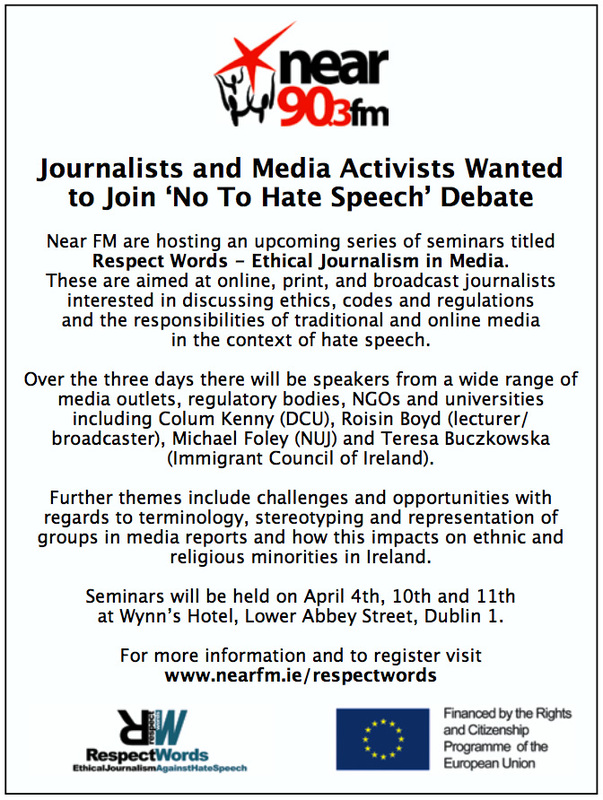 No Hate Speech Movement Ireland: We are the Republic of Ireland campaign group within the wider European No Hate Speech Movement. We are young people standing for human rights online.Youth Ambassadors are the heart and the power source of the No Hate Speech Movement. Whether acting on the European stage or at national, regional or local level, the Ambassadors communicate the campaign’s message far and wide. Among the online community of Ambassadors are those who run our Facebook page, our twitter feeds, who moderate our blog posts and report hate speech and give presentations and workshops in schools, colleges and youth groups, who promote the campaign at events – all on a voluntary basis. There are also activists who take it upon themselves to directly counter hate speech. The No Hate Speech Movement would be nowhere without the dedicated hard work of our Youth Ambassadors. Gavan Titley joined National Universtiy of Maynoothin 2005 where he is currently a Senior Lecturer in Media Studies and Head of Department. His research interests are in the politics of race, racism and multiculturalism in European politics, freedom of speech and ideas of ‘hate speech’ in digital media environments, the future of public service media and social theory in media theory. Shane O Curry is the director of ENAR (European Network Against Racism Ireland) the Irish coordination of the European Network Against Racism. ENAR comprises over 170 Non-Governmental Organisations across 30 European States. ENAR Ireland has 70 organisations in its network and coordinates the racist incident reporting tool iReport.ie. Shane is a social activist who has worked and campaigned in the areas of human rights, social justice, anti-militarism and conflict resolution, with a special interest in working against racism and other forms of exclusion. Previously, Shane coordinated a popular education projects with Clondalkin Travellers Development Group, the Latin America Solidarity Centre, Inishowen Community Radio and the Pat Finucane Centre for Human Rights in Derry. Colum Kenny is an author and emeritus professor at Dublin City University and formerly chair of the Masters in Journalism programme at DCU. Columnist for the Irish Times. Areas of special interest include media and culture, history and society. A member of the Broadcasting Authority of Ireland 2010-2015 and of the Broadcasting Commission of Ireland/IRTC 1998-2003. A former employee of RTE, he was a founding board member of the E.U. Media Desk in Ireland and is a council member of the Irish Legal History Society. Celene Craig has been Deputy Chief Executive of the Broadcasting Authority of Ireland (BAI) since its establishment in 2009, in addition to having worked with its predecessors, the Broadcasting Commission of Ireland and the Independent Radio and Television Commission. Celene is also the President of the European Platform for Regulatory Authorities (EPRA). Lisa Ní Choisdealbha is the Executive Director of the Independent Broadcasters of Ireland (IBI). She previously worked as Irish Language Officer for the BCI. She has a degree in Music and Irish from UCC, a masters in Communications and Cultural Studies from DCU and an MBA from Henley Management College in London. She is a traditional Irish musician having won All-Ireland titles on fiddle, a fluent Irish speaker and a big GAA fan cheering on her native Tipperary as often as possible. Irena Djak Cvetkovic is working as a Producer and a Trainer with Athlone Community Radio. Irena has an M/A in Media Studies and her research is on Media Literacy and Community Radio. She successfully produced radio programme funded by the Mary Raftery Fund, on Asylum Seekers and Mental Health. She also produced more than dozen documentaries supported by the Broadcasting Authority of Ireland. Catherine Joyce is the manager of Blanchardstown Traveller Develpment Group. Catherine is an advocate for Travellers human rights for the past 30 years. BTDG was instrumental in pursuing ethnic status recognition by the State which was achieved on the first of March this year. Catherine revived the People of the year award in 1992 and has represented travellers at a local, national and international level. 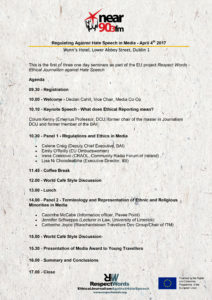 Jennifer Schweppe is the co-Director of the Hate and Hostility Research Group at University of Limerickand co-Director of the International Network for Hate Studies. She has conducted extensive research on the need for, and form of, hate crime legislation in Ireland. Caoimhe McCabe worked as a newspaper and television reporter before joining Pavee Point as Information Co-Ordinator. Over a 15 year period of media archiving, Pavee Point has been able to build up a good overview on the representation of Travellers and Roma in the media.